Mobile electronic device forensic examination needs practical, affordable on-site data extraction capability. 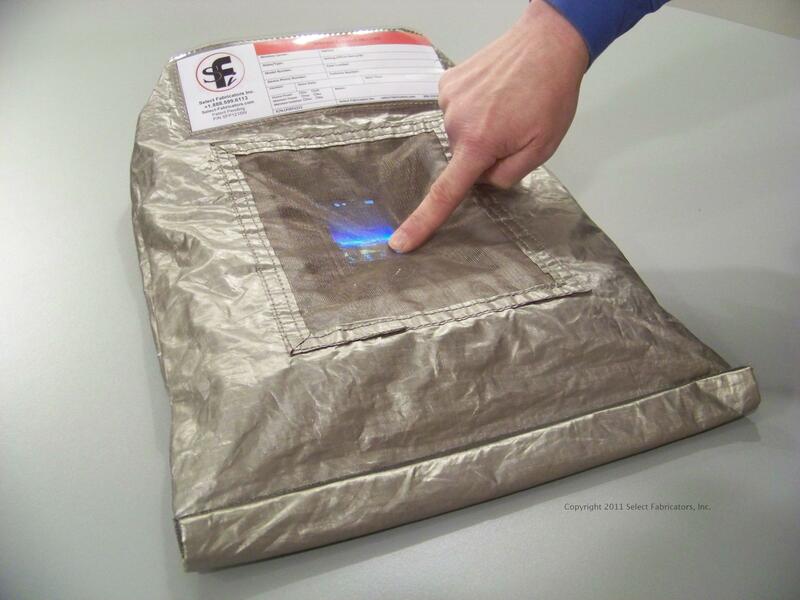 Select Fabricators, Inc. is introducing a new portable, RF-tight containment device usable in field operations. The SFP1215W Forensic Pouch gives the law enforcement community the means to secure and manipulate wireless devices. The USB 2.0 connection included on the input/output plate allows the connection of a secured device to a forensics computer in the field or in the lab. The SFP1215W works with any portable wireless device including Smartphone and tablets utilizing capacitance sensing touch screen. Weighing less than one pound, Select Fabricators’ SFP1215W Forensic Pouch is more affordable and easier to transport than bulky metal enclosures. Made of flexible materials, the unit can easily be stored in a weather resistant carry bag along with evidence collection equipment in vehicles for quick deployment. An evidence card is included in a clear pouch for instant documentation. SFP1215W is manufactured in the USA with SFi’s proprietary Silver/Copper/Nickel fabric. This conductive, flexible material is the same fabric used over the past decade at Select Fabricators to make room to table top sized RF shielded enclosures. Material test results in average shielding effectiveness of -85 dB in the range of 30 MHz to 1 GHz and -80 dB in the range of 1 GHz to 11 GHz. Select Fabricators, Inc. specializes in the design and manufacture of flexible solutions including RF/EMI shielding enclosures, pouches and curtains, machinery covers and shrouds, aerospace covers and assemblies, cleanroom bags and assemblies, and high strength / high barrier custom bags. The common denominator to all SFi products is the use of flexible materials to provide protection and / or shielding. Select Fabricators is located in Canandaigua, New York USA. Founded in 2000, it is privately owned. Each of the partners has extensive experience in the flexible packaging and RF/EMI solutions including research, design, manufacturing and fulfillment. For more information, visit our website: www.select-fabricators.com. Posted in Business News Releases. Next Post Co-Editor of Personal Money Management Workbook.